I turned on the tv to find out what the weather would be that day. Once again, rain (although I haven’t mentioned it in a while, it has rained every day). 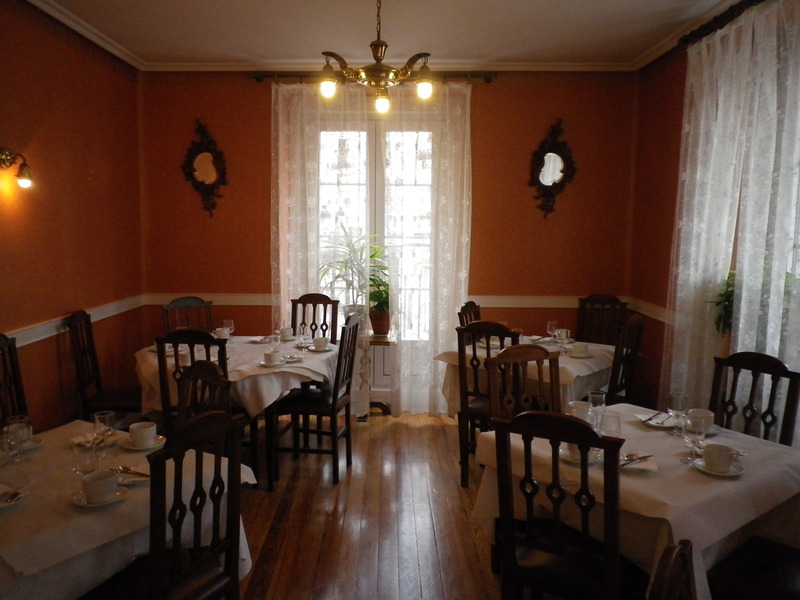 A nice breakfast awaited me in the dining room of the hotel and my clothes were fresh, clean and dry. 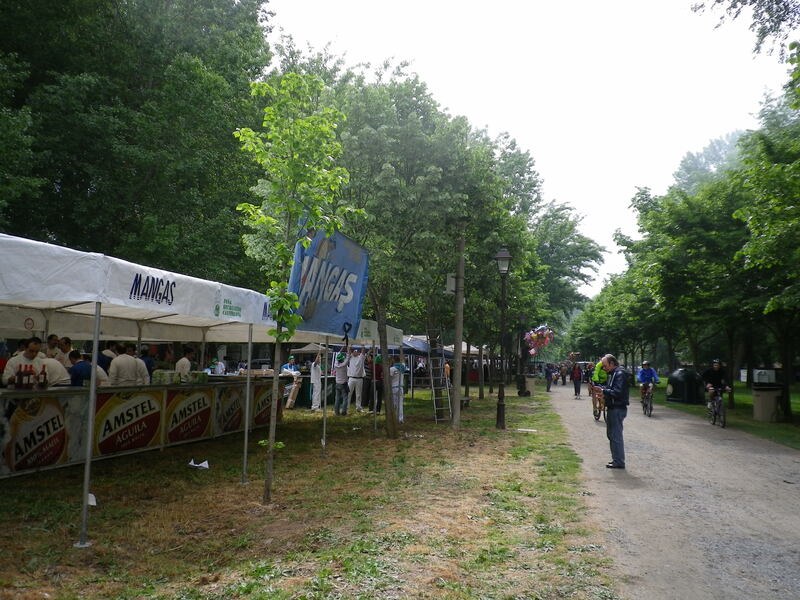 I made my way through Burgos, going through the festival the city was holding that day. Because of the tents and stalls set up for the fest, I couldn’t make my way to the few sights I still wanted to see before I left town. Oh, well, maybe next time. The rain started pouring when I stopped in Tardajos to get a tortilla and beer but I prepared every day for heavy rain, with my rain cover on my pack and wearing my rain jacket. I had originally planned to stop in the town of Rabe de las Calzados, about 13 kilometers from Burgos, for the night, but I was feeling good about walking and decided to continue all the way to Hornillos, 20 kilometers and the start of the Meseta. 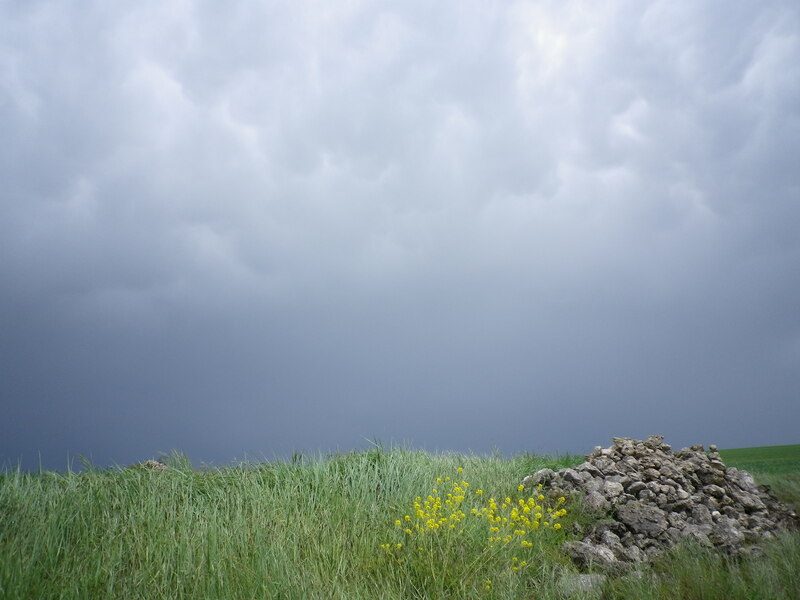 The rain stopped but darker storm clouds gathered in new, threatening fury. I was walking alone and suddenly there were dark, black-grey clouds to the front, back, and either side. I had entered the Meseta, the place most prized by some pilgrims, dreaded by others. 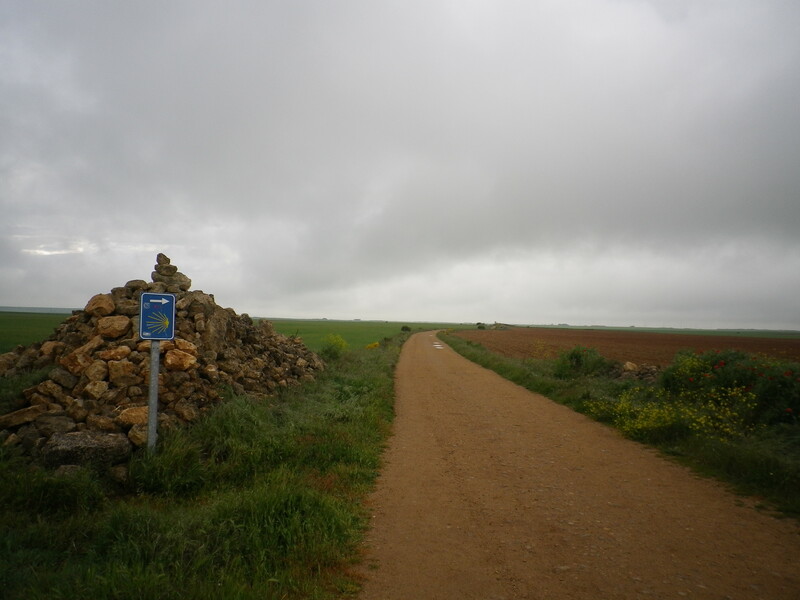 The Meseta is the flat part of the Camino Frances, providing thousands of acres of farmland for the breadbox of the country. For many, the flatness is a welcome relief from the ups and down of the previous kilometers of the Camino. For others, it is a very long, boring walk. And, in a thunderstorm, you are the tallest thing around. You and your metal hiking poles. The blisters which had started to disappear so nicely during my short stay in Burgos began to once again sneak in as my socks and boots got wetter and muddier. So much for the clean pants I had delighted in earlier in the day. I hoped that Mary Helen and Carolyn were prepared for this part of their opening-day Camino experience. As the clouds grew darker, I glimpsed another pilgrim, a woman, just around the slight bend in the trail in front of me. Ponchos have a tendency to flap madly in the wind and her’s was no exception. Her dark green poncho fluttered violently around her in the coming storm like a giant dark gown, yet her dogged march forward inspired me as I kept going. I said a prayer, acknowledging that everything would be in good hands, put my head down, and continued on, knowing I would catch up with her soon because of my quick pace. The rumble of thunder came from over my left shoulder. Yet, the rains never came. All around me, I could see the rain falling in sheets over the acres of flat meseta, as portions of horizon were obliterated by the storms. It was windy and cold and I kept my poles tucked close to my body (just in case). The Camino was muddy from the rain that had fallen just in front of me. I looked ahead to see how the woman in front was doing. But there was no road, no path leading off the Camino here, no clumps of trees to seek temporary shelter. It was a straight stretch as far as one could see. Where had she gone? And I knew I was walking faster than she was (Ask anyone – I have a good pace). Rain began, but not storm rain, just normal rain. I was no longer in danger of being electrocuted on the Camino. I continued to the soggy town of Hornillos, another story. I never did find that woman with the poncho. Saints? Big Tess at it again? This entry was posted in camino de santiago de campostella, Religion, Travel and tagged backpack, Camino de Santiago de Campostella, Saints, Spain, women hikers. Bookmark the permalink.
. . . and what will the final impact of this trip be? Won’t know until the journey ends (and THAT should inspire lots of comments). Janet, thanks for following. I really appreciate your feedback and friendship. the banana is not yet orange, but I think of you and your amazing journey every day. So inspired that you have the courage to experience life as it is….kudos to you my friend!! !